On the scene as fans gathered at Chris Cornell's grave for the Soundgarden singer's public memorial. 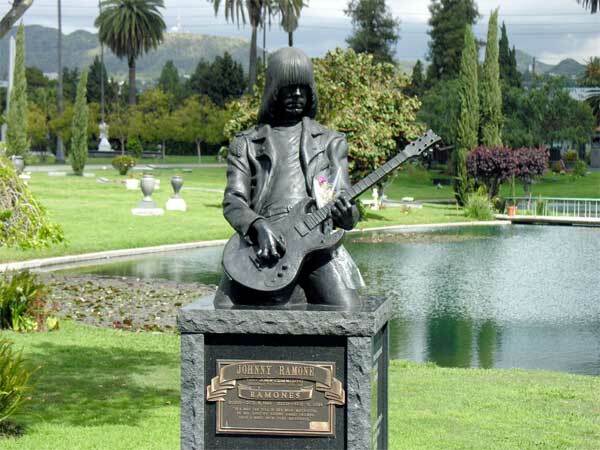 The headstone fittingly laid beside the memorial statue of the late Johnny Ramone, an epic sculpture of the punk rock guitar hero leaning into a riff. In recent years, Cornell had been a VIP guest at Hollywood Forever’s annual birthday celebration for the late Ramones guitarist. (The cemetery is also where bassist Dee Dee Ramone is buried.) A mountain of flowers, scattered guitar picks, prayer beads, beer bottles, votive candles, drawings and personal notes – “Thank you, Chris” and “Rock in Peace,” among them – quickly covered Cornell’s headstone. “Is it weird to love someone you didn’t know? I think all these people here loved him in their own way,” Rita Neyter Skiles, a Cornell fan since she was a teenager in the early 1990s, tells Rolling Stone. Neyter was now mourning in a long black dress and tall laced boots. Coming to see and touch the headstone was “therapeutic,” she adds. She met Cornell decades earlier at a Soundgarden autograph signing at a Hollywood record store and saw him perform at least 15 times in his bands’ and solo tours. The last time was his 2015 solo acoustic tour behind his Higher Truth album. Coming to the memorial made the shock of his death real, she says. During a career of more than three decades, Cornell rose from the alternative underground to become a Grammy-winning, platinum-selling artist and one of the most powerful and distinctive singers in hard rock. At 52, he died by suicide in his hotel room in the early morning of May 18th, just hours after performing a Soundgarden concert in Detroit. On the narrow asphalt road beside the gravesite, Angel Morales, 40, set up a microphone and plugged an electric guitar into a small P.A. to perform two Audioslave songs. He began with “I Am the Highway” and followed with the soaring “Like A Stone” before cemetery staff interrupted him. Other fans continued singing the song as Morales packed up.